This salad is sweet, savory, crunchy, and all the wintry feels. It’s seriously one of my new faves, y’all! A massive shout out to my adorable grandpa (aka Abuelito) for forcing donating about 1,000 pecans to Cody and I from his little yard. And another massive shout out to the guy we hired to shell these pecans because OMG SO MANY PECANS. Sooooo many, you guys. Here we are over a year since my grandpa gave them to us, still putting them to good use. How long do they even last? I’m gonna need ALL of your fave pecan recipes, like, right now please and thank you. I might need to make a few rounds of Pecan Pie Bars and Pecan Pie Pancakes! 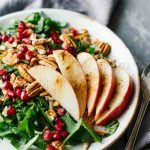 About this Pomegranate Pecan Salad w/ Cinnamon Apples. It’s literally everything you see in the title, plus spinach and a little bit of olive oil! SO easy. I made this thing in about 7 minutes and downed it in about 4 (I know, I know, I should eat slower. But I was running super late to my hair appointment! You do what you gotta do). For those of you who don’t have a million pecans in your possession at the moment, I recommend buying pre-shelled pecan halves. 😉 It just makes life a little bit easier, ya know? And the same for pomegranate arils. You can buy them ready to eat! I don’t always buy things pre-cut, sliced, or ready to eat, but I definitely go that route when it comes to pomegranate arils! Chop the apple into squares or slices. Top with cinnamon. Top spinach with cinnamon apples, pomegranate arils, and pecan halves. Drizzle with olive oil. Oh my gosh, LOVE this! The perfect way to lighten up a holiday meal and still keep it festive. Those cinnamon apples are a great touch! This is awesome! The combination of pomegranate and pecans seems really interesting! Yum! This looks so light and fresh! I’m so happy that pomegranates are in right now! Thank you! YES, they are EVERYTHING right now! Loving those cinnamon apples on a salad! A perfect fall dish!